The laboratory anti-friction bearing crushing rolls are of rugged construction for batch or continuous abrasive size reduction service in mineral, chemical and industrial applications. It is ideal for batch sample feed preparation for subsequent grinding, leaching and other processing operations. 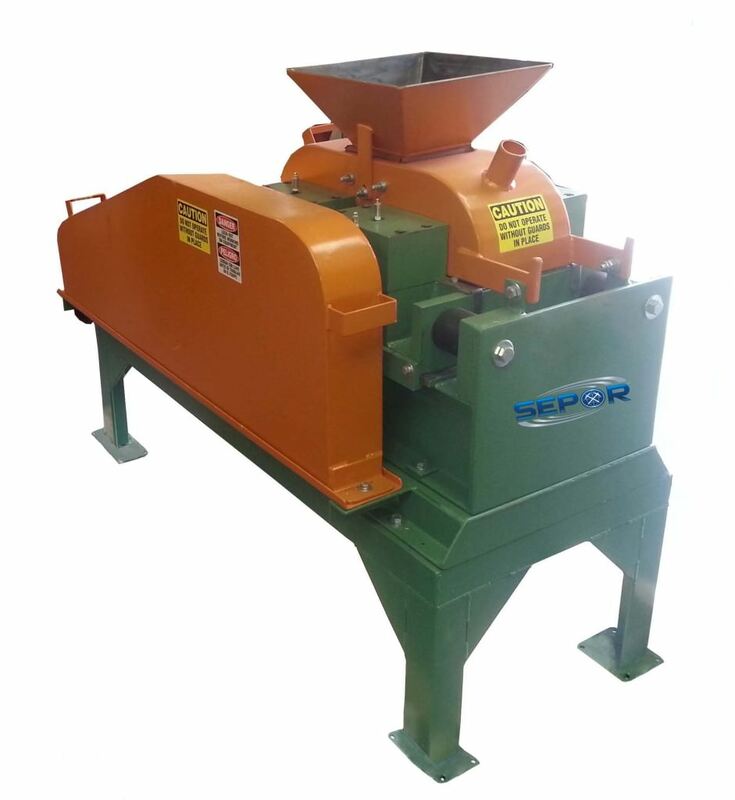 Also, it is suited for use as a secondary crusher in continuous pilot plant crushing circuits, and small continuous industrial crushing applications involving brittle or friable material. The portable support stand is available for laboratory flexibility. Size reduction of 3/8″ to 1/2″ feed to approximately -10 mesh in a single or multiple pass operation is possible with this crusher. The feed rate is 2 tons per hour, based on a medium hard ore.
Easy to operate with convenient hand wheel adjustment of the rolls clearance. Designed for minimum maintenance costs, with double seal roller bearings mounted in sealed carriers for removal as a roll shaft unit. Roll shells and check plated. Roll shells are shrunk onto a tapered machined core and will retain position even when the shell wears thin. The roll shells are constructed of an alloy steel for abrasive service. Full roll cover is hinged for easy access to the grinding area for cleanout between sample runs. Hard rubber “bumpers” position fixed roll, minimize shock and help protect against damage due to tramp material. The crusher is available with the optional support stand for flexible operation in the laboratory. Includes a large diameter connector for attachment of dust venting system. Includes feed hopper and tramp material protection.